I installed my Cosair H50 water cooler and saw a dramatic reduction in core temperature. OCed to 3300Mhz last night. I was able to play BFBC2 with all settings on absolute highest. The core temp stayed around 55C (down from 85C without the H50) and at that speed I was able to run Frabs on LOOP with only a loss of a 3 to 5 framerates -- awesome results. Its good to see your getting your temps under controll. I have heard a great many things about the H50 and its big brother H70. I think on my next build those are going to be the coolers that Ill be looking at getting. Thanks for the updates!! I put in an H50 on my PC because the stock fan for my AMD 1090t was so loud it sounded like a vacuum. It is stupid quiet and keeps my 6 core very cool. A bit of a pain to install on my PC because everything was already in the case. But, its really easy if you are building a new one from the ground up. I've had an H50 sitting in the box for a few months cause I was saving it till I bought a new case. I might have to hock it and pick up an H70! That thing looks awesome. 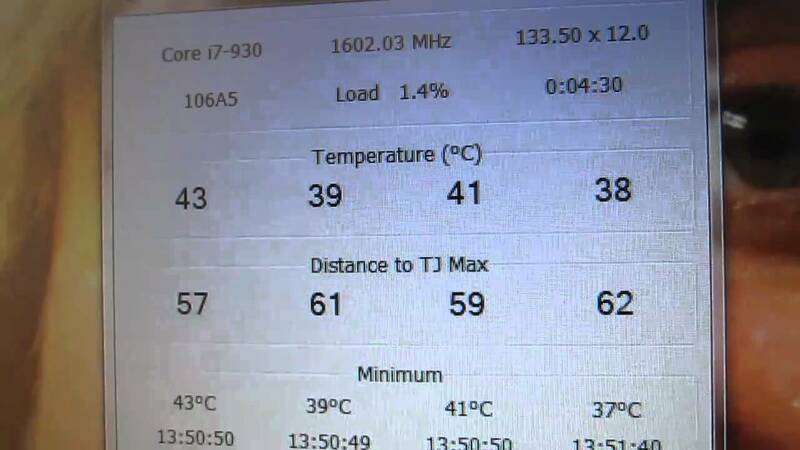 "I bough corsair H70, despite the hardtime installing it by forcing this big radiator into my CoolerMaster CM 690 II, and breaking some of the tall VRM cooler of ASrock x58 extreme3, the temps were not very bad....hitting 83C with 100% loaded prime for a hour with my i7 930 @ 4.2GHz...but a hell of problem with the fan sound, even by using 1 fan on this cooler my computer was about to take off and I could not sleep in my room"
I don't know about the H70's but my H50 is so quiet that the first time I turned on my computer with it, I was worried that it wasn't working. I as well! In fact, I pulled it and put in the stock fan until I knew all else was working. Usually the reason people think this is they forget about SpeedStep/Cooln'Quiet features which underclock your CPU for power/sound savings until the demand is there for higher speed. Unless you turned this feature off you should still notice your CPU dropping to a lower frequency than what you set it to. Thanks. I have OCed the rig to 3790 MHz for now. Temps run a little high in the mid 70's when rendering a video. I'll open a Overclocking thread in the Hardware forum to detail my OCing attempts and issues later on. Those are some impressive results! I have an H50 as well on my i5-760. At stock speed and ambient temp 19°C, temps are 29°C idle and 41°C after 2 hours running Prime95. This is without any case intake fans too other than the H50 fan blowing in, too! Better use the ASUS software and keep an eye on the IOH temperature of the RE3 motherboard. The IOH is part of the north bridge. I noticed that my IOH tends to run hot. There are many examples on the ASUS forums that the factory assembly of the stock heat pipes don't always seat correctly. My rig has been up and running stable for a month now on air. This weekend will begin the conversion to water. I just set up a new rig as well with an H70 but with a Rampage III Gene mobo. Here is how I have my H70 situated. It's setup as the push/pull intake from the top. However it's really loud. I'm going to change it back to the suggested position at the rear of the case, because I had it there initially and it was quiet. I just wanted to try out different positions. It didn't seem to make that big of a difference apart from the noise. Here's what I get at idle at a 4Ghz overclock. And here's what I get at load on a 4ghz overclock. Now I know it's overclocked, but do those temperatures not seem a little high? At stock speeds temps were about the same as E-Male's. And I even have the H70 with 2 fans on it. I had a little trouble seating the pump the first time. I'm going to try to reseat it after I get some new thermal compound. E-Male here are some nice references for overclocking your CPU. You guys probably have different ambient temperatures and airflow setups(including location in the room/building in comparison to the AC vent and system). E-male...just curious because I don't know about your specific MB, but when you move the GPU to a different slot you may want to look in your MB handbook and check and see if the slot you moved to is rated the same as the original one you had it in. I know some crossfire/SLI boards recommend you use a certain slot if only using a single GPU as the ratings of the PCI-e slots may vary....just a recommendation. and if you were getting temps like that in a 100F room then I will answer your question with a yes.....it was worth the $100 you paid.